Along with every generator comes extra accessories like gas cans, tachometers, funnels, and other items to test and make sure your generator is working optimally. The last thing anyone needs to worry about is having a backup power source but no gas. Below are the most common items purchased in conjunction with best-selling generators. You’ll most likely need at least a couple of these items to make maintenance and the use of power much easier. That’s a lot of mowers. Husqvarna started in 1995 producing solar mowers. In an effort to help with a more green society and get rid of emissions, they created a mower that was more efficient and needed no gas to run. On top of that, it was automatic. Husqvarna leads the global market with it’s products in the robotic mower industry. It’s no surprise that they will continue to stay ahead of the curve given their mission to succeed in the market. With the over 20 years of experience in the robotic mower industry, Husqvarna has learned how to increase better cuts and a better handling of yards with complex gardens or landscaping with its robotic mowers. They are definitely trying to make the lawn cutting process completely autonomous. A robotic mower is energy efficient and has almost no emissions during use. The electricity consumption for maintaining a 1,000m² lawn is approximately equal to a 11W light bulb. Today it is possible to control, program and track your robotic mower via a smartphone or tablet app as well as easily control the watering and lawn care from anywhere, anytime. To be clear, this does not only include the Husqvarna Automower lineup, but also brands such as Gardena, McCulloch and Flymo. All are designed to be an automatic system to help with lawn care and more. Worx Landroid: The Most Affordable Robotic Lawn Mower? Husqvarna Group is a global leading producer of outdoor power products and innovative solutions for forest, park and garden care. Products include chainsaws, trimmers, robotic lawn mowers and ride-on lawn mowers.The Group is also the European leader in garden watering products and a global leader in cutting equipment and diamond tools for the construction and stone industries. The Group’s products and solutions are sold under brands including Husqvarna, Gardena, McCulloch, Poulan Pro, Weed Eater, Flymo, Zenoah and Diamant Boart via dealers and retailers to consumers and professionals in more than 100 countries. Net sales in 2016 amounted to SEK 36bn and the Group has around 13,000 employees in 40 countries. Out of all the cool outdoor gadgets, some of these on this list make me wonder how people even think of them! Enjoy this list of things you might consider. If you’re lacking a couple of lawn chairs (you know, the portable kind) and want to sit in the grass, but not on a flat surface, you should check out the Terra Grass Armchair (Amazon Italy) to see what you think. The project was on KickStarter and raised enough money to make the products. The whole thing is just cardboard and what you can do is build it, plant your seed in dirt and wait for it to grow. Different kits are available which will let you upgrade one of your seats to a sofa. That sounds pretty awesome! The Edyn garden sensor sets up continuous monitoring of your garden to inform you of any changes in light, humidity, temperature, moisture, and even soil nutrition! Depending on the weather forecast, you’ll be notified of changes and comparisons with a plant database. Download the app to see how your garden is doing from anywhere (since it’s Wi-Fi connected). Another cool feature about this gadget. It’s solar powered.One of the best parts about the features are that it will recommend certain plants according to your soil and climate region. That’s something an ordinary person can’t do without years of experience. Check out the Edyn Garden Sensor on Amazon! Wi-Fi connected, real-time monitoring of your plant and garden needs. For this one, you’re going to need a tree, but it will definitely be worth your time. 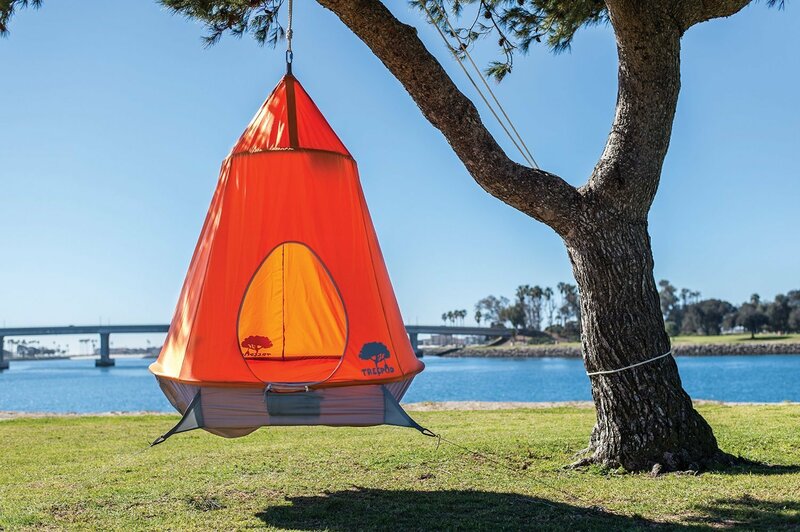 With a capacity of up to 500 lbs., the Treepod Hanging Tree House is fully portable and breaks down to be used for camping, parks, or just your backyard. Certifiably an outdoor gadget worth mentioning. Right now it’s offered in four different colors and built with nylon and an aluminum framing. The fabric is (of course) weather resistant, so if you want to be outside in the rain, no big deal. Measures 7.5 feet tall x 5 feet wide. 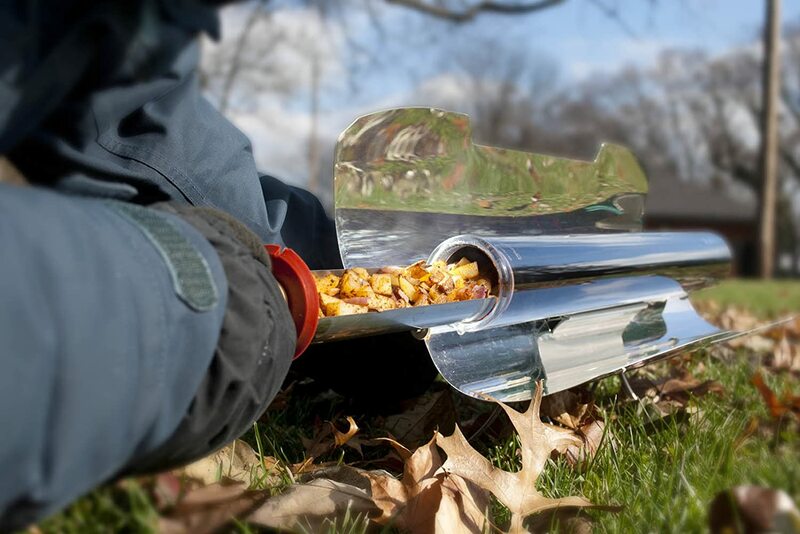 You might have a grill in your backyard, but when it’s full, you can resort to using the GoSun Portable Solar Cooker for steaming, frying, baking, or even boiling. It’s perfect for a pack of hot dogs (you know, the vegetarian kind) or pretty much anything you can fit. As long as the sun is shining, you’ll be able to cook on it. It has mirrors to help retain the heat from the sun to be used as a stove. But, remember to get a backup charcoal grill for the nighttime. 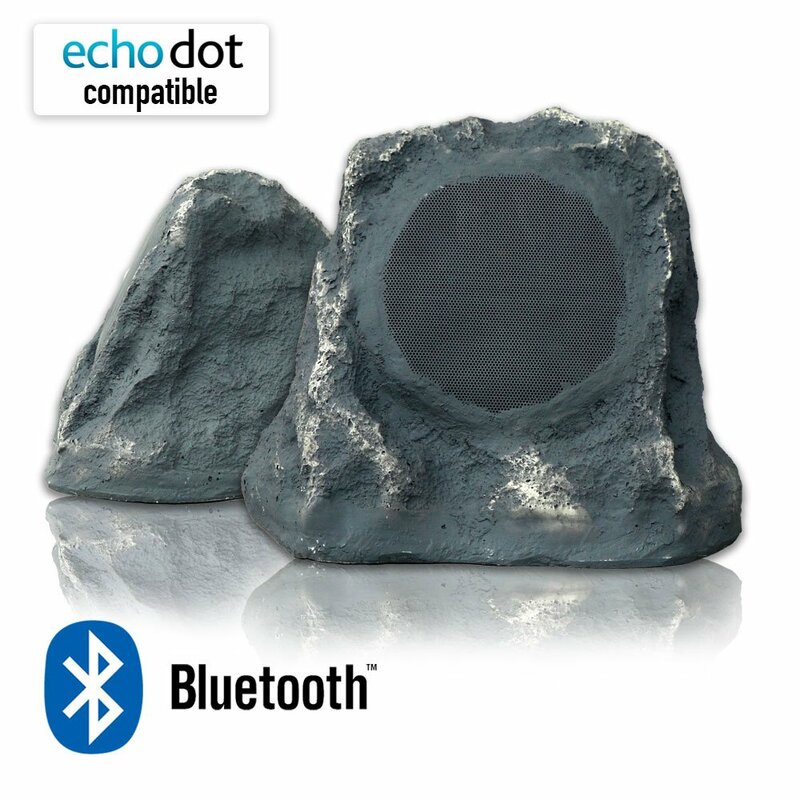 You might have one of the bluetooth speakers that to carry around with you from place to place, but how well does it blend into a backyard? Unless it gets painted the same color as grass, these rock speakers are probably going to blend in better! They are designed to withstand extreme heat or cold – without reduced life or failing and have a 40W output to put out enough sound for medium or large sized backyards and patios. Click here to see the bluetooth speakers on Amazon. Hope you enjoyed these! I know I’m looking forward to getting a hanging tree house once we plant a tree in the backyard…but, the garden sensor seems promising!